Soil moisture under vegetation cover and its spatial and temporal change from point to catchment scale are crucial for understanding hydrological processes within the vadose zone of the soil, e.g. to support drought and flood management or to optimize yield by precision farming. Soil moisture controls the partitioning of rainfall into runoff and infiltration (e.g. during precipitation wetting), which leads to soil storage or ground water recharge. It also divides the available energy into sensible and latent heat fluxes in regions, where evaporation is water-limited. Therefore it determines the rate of evapotranspiration (e.g. during dry-down events) and in the end the land surface water budget. Hence, soil moisture is a key variable for characterization of the soil hydrological state and also a proxy parameter for plant growth and vegetation vitality. In order to account for the moisture variability within the topsoil, monitoring larger regions requires rather an airborne or space-borne remote sensing technique than single point measurements on ground (traditional method) (see Fig. 1). Therefore soil moisture retrieval under vegetation cover is approached within the research efforts of the hydrosphere section using polarimetric SAR observations at longer wavelength (L-band, l=23cm). 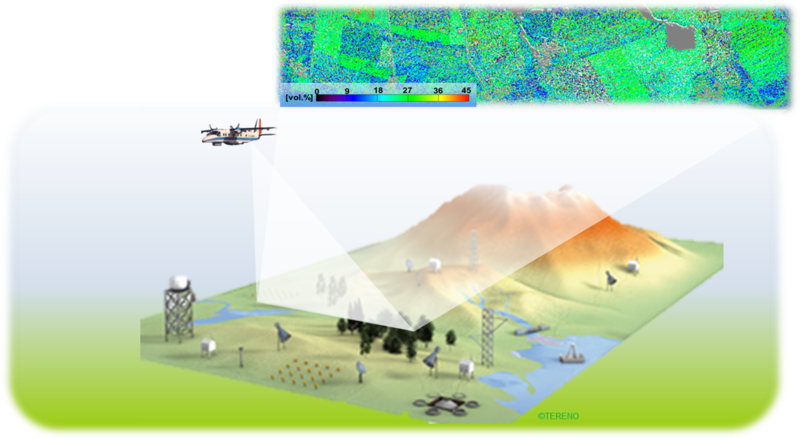 In this way, the penetration capabilities of L-band through the vegetation are combined with newly developed polarimetric decomposition techniques to separate different scattering contributions from the vegetation and from the underlying ground. Subsequently the ground components are inverted to extract surface soil moisture. Fig. 1: Acquisition Scenario for a wide-area SAR-based soil moisture retrieval under vegetation cover compared to small-scale methods for soil moisture measurements. In order to test the developed algorithms for a later space-borne implementation on a satellite, the airborne E-SAR and F-SAR sensors of the German Aerospace Center (DLR) acquired fully polarimetric SAR data during ten campaigns at different research test sites (Wallerfing (LMU/DLR), DEMMIN (GFZ/DLR) & other TERENO Observatories) across Germany. The results reveal inversion rates up to 99% of the study area for the retrieval of soil moisture in agricultural and grassland regions, whereas forested and urban areas could not be inverted due to the mismatch of scattering from forests and cities with the applied scattering models at L-band (see Fig. 2). Fig.2. 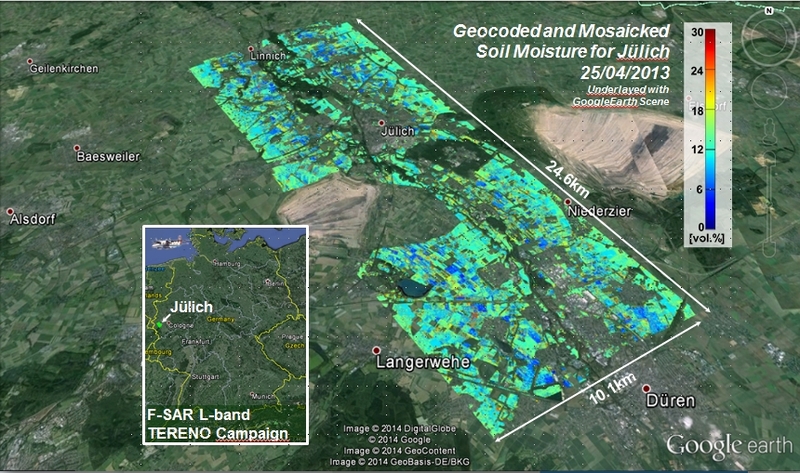 Wide-area soil moisture retrieval using F-SAR data at the TERENO Eifel observatory. A region of 10km x 25km can be mapped, potentially serving as spatially distributed input for hydrological or environmental models for instance. Due to the unique research network within the hydrosphere section of the alliance (see Fig. 3), there are plenty of soil moisture measurements from different test sites available for a cross validation and a thorough quality assessment of the moisture retrieval. 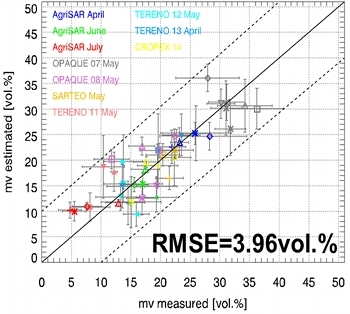 The validation with simultaneously acquired field measurements from the ten different campaigns results in an accuracy (root mean square error) below 4.0 vol.% for the soil moisture (varying between ~0-40 vol.%) within the catchments (see Fig 4.). The validation confirms a successful soil moisture inversion under a large variety of different agricultural land covers at diverse phenological stages and also indicates the robustness of the methodology. Fig.4. Validation of SAR-based soil moisture estimates with in situ measured soil moisture values for 10 different E-SAR and F-SAR campaigns (22 scenes) of the last eight years (2006-2014). Grey bars indicate the standard deviation of the measurements and the estimates on the different crop types from grassland, pastures, cucumber, crops, canola until maize (different symbols). In addition, the newly developed polarimetric decomposition techniques for soil moisture retrieval are physically based, easy to implement, computationally inexpensive and analytically solvable without a priori knowledge. Therefore the methodology is applicable without test site restrictions in any non-forested and non-urban area. Especially, the future, space-borne, long wavelength mission Tandem-L can profit distinctively from the developed polarimetric decomposition techniques for separation of ground and volume contributions as well as for a global and continuous soil moisture monitoring in unprecedented accuracy and quality. 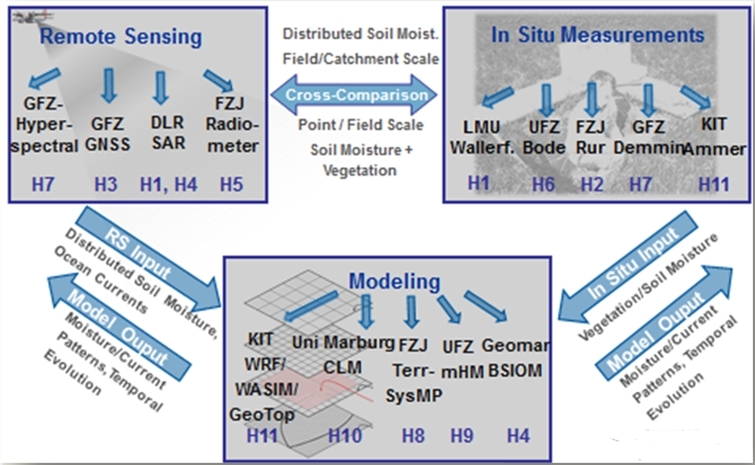 As a next step on the research agenda of the hydrosphere section, the retrieved soil moisture maps will serve as an input for hydrological models to investigate, if and to which extent spatially distributed, high resolution soil moisture information can improve the accuracy of the modelling results. Moreover, the developed methodology will be further investigated and validated with soil moisture networks and lower resolution moisture maps from operating satellite missions (e.g. ESA’s SMOS or NASA’s SMAP mission) for spatial analysis of the retrieved soil moisture patterns at different scales. Jagdhuber, T., Hajnsek, I. & Papathanassiou, K.P. 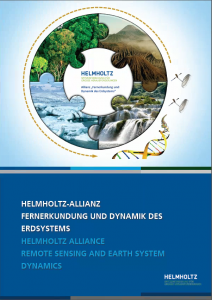 : An Iterative Generalized Hybrid Decomposition for Soil Moisture Retrieval under Vegetation Cover Using Fully Polarimetric SAR. Journal of Selected Topics in Applied Earth Observations and Remote Sensing, 2014, DOI: 10.1109/JSTARS.2014.2371468, in press. Jagdhuber, T., Hajnsek, I., Bronstert, A. & Papathanassiou, K.P. : Soil Moisture Estimation under Low Vegetation Cover using a Multi-angular Polarimetric Decomposition. IEEE Transactions on Geoscience and Remote Sensing, vol. 51, 2013, pp. 2201-2215. Jagdhuber, T., Hajnsek, I. & Papathanassiou, K.P., Polarimetric Soil Moisture Retrieval Using an Iterative Generalized Hybrid Decomposition Technique. Proc. of IGARSS, Québec, Kanada, 13.–18. July, 2014. Jagdhuber, T., Hajnsek, I., Papathanassiou, K.P., Tereno Observatories – Validation sites for a SAR-Based Soil Moisture Retrieval under Vegetation Cover, Proc. of Int. TERENO CONFERNECE, Bonn, Germany, 29. Sept.–2. Oct., 2014.